The basement area of your home is the perfect place to increase the square footage and value of your home. When designed correctly, your finished basement will give you years of pleasure. A finished basement can be designed for more living space, sports room, (such as a Ravens or Orioles room), theater room and much more. The finished space can include full or half baths, wet bars, even wine cellars and your ides and needs. 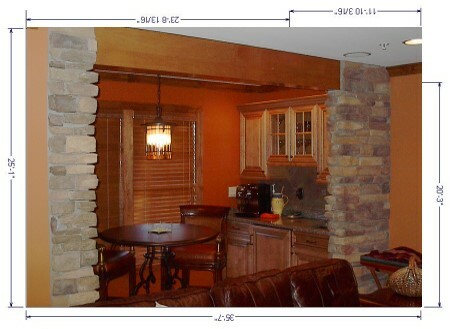 Caton Contracting and Remodeling no cost consultation. At this consultation, we willmeet with you and walk the basement area. We will listen to you idea that you have for your new finished basement and share some of our idea and expertise on finishing off a new space. At that meeting, we will take measurements and notes on the existing basement condition to provide you with a cost based on our walk through and our discussion of ideas to finish the space. We will take the information back to our office and design the new space from our meeting. After our design is complete, we can provide pricing based on the new design. We can then meet with you once again and review the design and pricing of you new finished basement area. For the finishing touches, we have partnerships with showrooms that feature fixture for plumbing, electric, cabinetry along with flooring and wall coverings.